In a landmark two-year study of Victorian fires, scientists from Melbourne University and the ANU examined satellite images of hundreds of thousands of trees burnt on Black Saturday. The scientists say the study showed conclusively that logging in the decades prior to Black Saturday made the deadly blaze much more ­extreme. 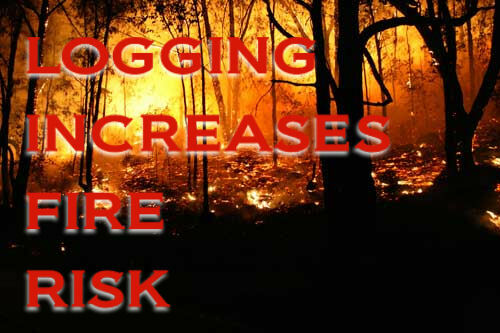 Professor David Lindenmayer, Australia’s leading scientist of forest ecology, who headed the study said it showed conclusively that clear fell logging increased the danger from bushfire. "We quantify the relationship between forest stand age and fire severity using a detailed case study of Mountain Ash (Eucalyptus regnans Muell) forest burned in south-eastern Australia in 2009. We focused on two important areas of Mountain Ash forest that feature a range of growth stages and disturbance histories. Using probit regression analysis, we identified a strong relationship between the age of a Mountain Ash forest and the severity of damage that the forest sustained from the fires under extreme weather conditions. Stands of Mountain Ash trees between the ages of 7 to 36 years mostly sustained canopy consumption and scorching, which are impacts resulting from high severity fire. High severity fire leading to canopy consumption almost never occurred in young stands (40 years) stands of Mountain Ash. We discuss the significant forest conservation and management implications of these results for Mountain Ash forests as well as other similar biomes, where high severity fire is a common form of disturbance." Rather than limit logging, the Victorian government intends to fight the fires through more fires, contrary to logic and good stewardship of our environment. Following the disastrous Black Saturday wildfires, the Victorian Government established a policy to burn 5% of all public land each year despite any fires naturally caused by lightning or other means. Sadly, most of the burning occurs in national parks and wilderness areas (where no one lives), simply to reach their ‘target’ of burning nearly 400,000 hectares annually. End deadly prescribed burns in Victoria and the carnage to native animals.